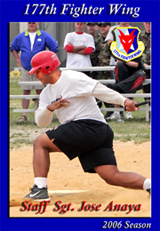 The 177th Fighter Wing held it's Second Annual Softball Tournament June 10 and 11. 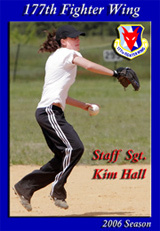 The tournament started in 2005, when then Wing Commander Col. Brian Webster instituted the Annual Softball Tournament. That year Accessories - Egress, Fuels, Hydraulics and Electro-Environmental shops - fielded an unstoppable team that slammed Operations 15 to 10. This year saw more teams, better players and fans that took an active part in the games. While some of the scores in the four inning games were lopsided, others were not. 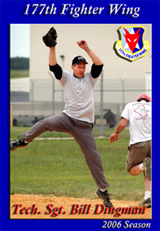 The final game once again pitted Accessories, which included several players from the Avionics Intermediate Shop, against Operations. The top of the first inning saw Accessories pile in run after run and for a while it seemed that Ops couldn't touch their rivals, yet when Operations got their turn at bat, they tied the score and the race was on. By the top of the fourth, Ops had pulled away and disaster was rushing at Accessories like a freight train without brakes. On the sidelines a group of Airmen who were cheering and booing both teams impartially had ratcheted up their heckling as the game neared its completion. In the bottom half, Accessories pulled it together and hammered Ops 7 to 6.